Tesla recently revealed a crossover variant of the Model 3 and there were no surprises. For an automaker that's all about being in the limelight and making electric vehicles that are surrounded in glamour, that's either a good thing or a bad one depending on whether you see the glass as being half empty or not. Getting the most obvious thing out of the way first, the Model Y is essentially a Model 3, but is slightly larger, offers seating for up to seven, and has that crossover shape that American consumers are nuts about. Range for the Model Y spans from 280 miles in the performance trim up to 300 miles in the long-range variant. Pricing starts at $48,200 (including destination) for the option with a range of 300 miles and climbs to $61,200 for the performance version. 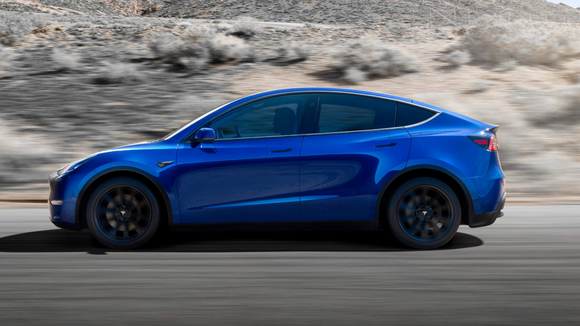 At the time of launch, the Model Y will be available in three trims. The base version is the Rear-Wheel Drive Long Range Model that has a range of 300 miles and a top speed of 130 mph. The vehicle can get to 60 mph in 5.5 seconds. Above that are two Dual Motor All-Wheel Drive trims. The most affordable of which is the Long Range variant that has a range of 280 miles and a top speed of 135 mph. Zero to 60 only takes 4.8 seconds for that trim. The top of the Model Y range is occupied by the Dual Motor All-Wheel Drive Performance trim that can travel 280 miles on a single charge. Specs for that trim include a top speed of 150 mph and a zero-to-60 mph time of 3.5 seconds. 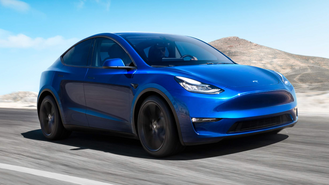 So the Model Y costs more than the Model 3, which starts at $36,200 for the cheapest trim with a 220-mile range, can't match the range of the sedan – when properly equipped, the Model 3 can travel up to 325 miles – and is only 10 percent (according to Elon Musk himself) larger than the Model 3. But what you get with the Model Y is extra space and the ability to seat up to seven. Speaking of space, Tesla claims the Model Y can hold up to 66 cubic feet of cargo space. That's much more than what you get with the Model 3, which is rated to hold up to 15 cubic feet between the trunk and the frunk (the cargo area at the front). While being 10 percent larger than the Model 3 may not sound like a big enough figure, the Model Y fits perfectly into the electric automaker's lineup. Before, the lineage went the Model 3 (compact sedan), Model S (large sedan), and the Model X (large SUV). Tesla needed a compact SUV and that's exactly what the Model Y is. The Model X was the only SUV that Tesla had before the Model Y and it starts at $89,200 and has up to 87.8 cubic feet of cargo space. 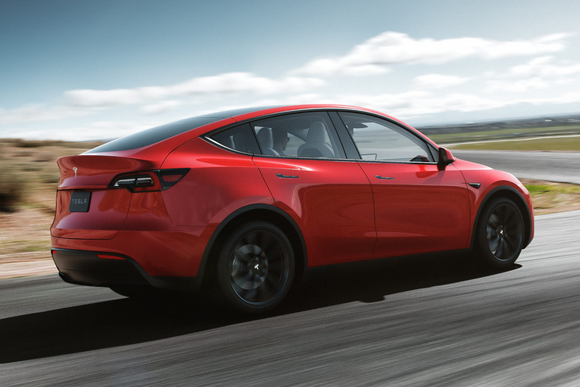 Like with other Tesla vehicles, consumers will have to wait a long time to get their hands on a Model Y. Tesla states that deliveries of the vehicle will begin in Fall 2020 for the majority of trims. If you want the most affordable Model Y with the standard range, you'll have to wait until Spring 2021. The timeline, if anything, is one of the major drawbacks to the Model Y. Then there's the tax credit situation. President Donald Trump has proposed a 2020 budget plan that would kill the federal tax credit for electrified vehicles. Tesla consumers saw the available federal tax credit drop from $7,500 to $3,750 at the beginning of 2019. Consumers that get their vehicles delivered after July 2019 will only be eligible for $1,875. Starting in 2020, consumers won't be able to get a federal tax credit for a vehicle from Tesla, and based on the automaker's timeline for the Model Y, it looks like the majority of people will fall under that umbrella for the new crossover. Then there's the issue of the competition. While automakers haven't caught up to Tesla's remarkable ability to offer EVs with over 300 miles of range, they're starting to get close. The Hyundai Kona Electric has a range of 258 miles and starts at $37,495. Nissan unveiled the new LEAF Plus with a range of 226 miles and a starting price of $37,445. The main last competitor is the Chevrolet Bolt, which has a range of 238 miles and a starting price of $37,495. While none of these have the range of the Model Y, they're more affordable and, at least for the time being, eligible for the full federal tax credit. The new Model Y may not be the most exciting vehicle in Tesla's lineup, nor may it be an option that raises the ceiling for EVs as a whole, which is something the rest of the automaker's vehicles has done, but it's exactly what the brand needs right now. Too bad it's still a year away from being delivered.